Erik Ransom and Aurora Black in "Coming: A Rock Musical of Biblical Proportions". Photo by Media Fine Imaging, Ltd..
Coming: A Rock Musical of Biblical Proportions is a blasphemous, heretical comedy for the New York International Fringe Festival that will make you feel like you're going to hell for laughing at all the clever quips, making fun everything from Jennifer Lopez to Hobby Lobby. Nothing is sacred, not even, well, God. This gender-bending version of the rapture, directed by Rachel Klein and written by Erik Ransom, follows Damien (Erik Ransom), the last surviving heir to the royalty of the biblical city of Sodom. 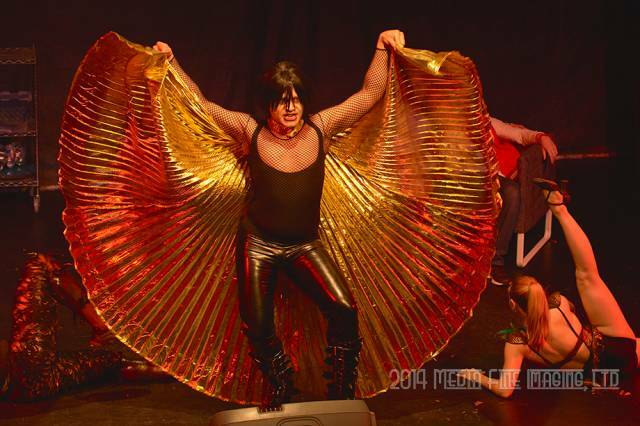 Damien is a pop star in NYC; less fire and brimstone and more the love child of Lady Gaga and Frank N. Furter. Damien is fierce, fabulous and the sworn enemy of God. When Josh Crenshaw (Glen North) rolls into Manhattan from Bethlehem, PA (Get it? Do you get it yet?) to audition for 'Merican Icon, guest judge Damien takes one look at his clean cut, aw shucks, farm boy, praise Jesus face, and dedicates himself to first ruining, then corrupting him. In Josh's corner there's Magda (Ilana Gabrielle), a pretty Slavic girl Josh meets at a bar his first night there with some strong pipes and dark past, and Pastor Pete (Mark Willis Borum), Josh's track suit-wearing, Snoop Dogg-talking, "cool homeboy," not-so-good conscience. In Damien's, there's his tour manager and lover Cain (Courter Simmons), and his devil worshipping groupies (Aurora Black, Avery Royal, Ashanti J'aria). The cast is fantastic, playing wonderfully off each other in every scene. Musically, though, while North, Gabrielle and Ransom all have strong voices, as an ensemble they lack a certain synchrony. While each actor contributes many laughs to the show, Ransom overshadows them all. His character's bizarre narcissism and heartbreaking devotion to his boyfriend makes him an utterly likable son of Satan. Ransom can even turn stage mishaps into comedy and in the end, makes the audience hope that evil wins this one. The original and diverse score and innovative direction make up for the sparse scenery. And despite it being a story as old as time, Erik Ransom breathes new life into the story of good versus evil by asking who exactly decides what's good or bad? Does faith have a monopoly on hope and love? All in all, Coming: A Rock Musical is an enjoyable and shocking (it is definitely rated R) retelling of the Book of Revelations. Performances of Coming: A Rock Musical of Biblical Proportions continue through August 22 as part of the New York International Fringe Festival. For more on FringeNYC shows, click here. Through August 22 at Theater 80. Aviva is a graduate of University of Maryland ('13) with a degree in journalism. She has studied theater in London and has worked backstage at the Clarice Smith Center for Performing Arts in College Park, Maryland. When she's not waiting for rush tickets at New World Stages, she can be found writing her blog in Bennett Park, taking ballet or watching Law and Order SVU.